"Christ himself gave the apostles, the prophets, the evangelists, the pastors and teachers, to equip his people for works of service, so that the body of Christ may be built up." While Christ-followers believe in one faith, one God, one baptism, we are still humans who struggle with sin, especially when relating to others, who come from different places, cultures and denominations, bringing diverse peoples and temperaments into lifelong relationships. Leadership sessions improve church health by practicing inter-personal skills that employ Biblical solutions to conflict management, collaboration and communication. KIT's interactive relationship workshops and leadership blogs offer hands-on guidance to our fully human responses by studying Scriptural insights, New Testament letters and Christ in Crisis. Scriptures point out that "a merry heart does good like medicine." "The Merry Heart" brings practical application to this proverb. Learn how to employ humor in worship, staff meetings, leader training without sacrificing honor and respect. 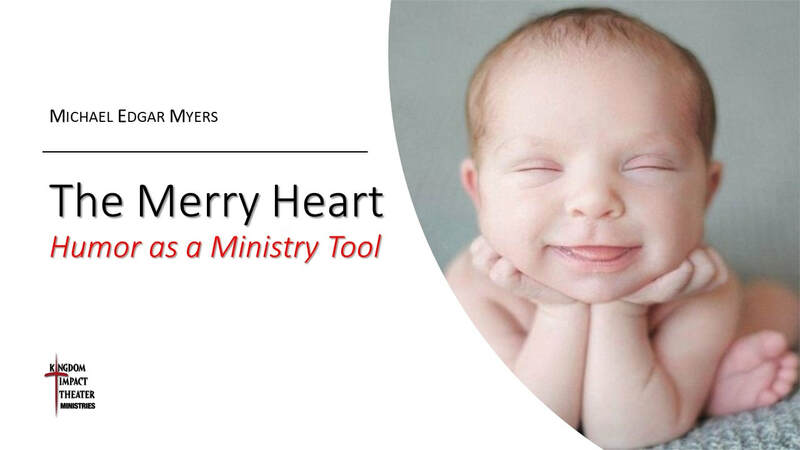 Through interactive activities and improvisation, discover how developing God's gift of humor diffuses conflict, improves health (physical, mental and church), and inspires spiritual growth by teaching members to humor "one another." Pastoral staff, ministry leaders, teachers, congregation. ​ Handheld mic, projector, computer, speakers. "Practicing What Is Preached" is an interactive, action-packed series of improvisation and theater-role playing to develop skills to manage conflict within church families, home families, work environments, or within your self. These activities are connected with Scripture passages to give Spirit-led support to practical actions when faced with issues that may be discussed during a sermon message. Discover methods to listen better, speak with grace, and their own contributions to negative situations by learning how to manage their own anger hot buttons. Participants will learn exercises that will enable them be better decisive relations by embrace conflicting as an opportunity for growth. 1-2 hours; series of small group or Bible study classes optional. ​Handheld mic, projector, computer, speakers. Sometimes working with Believers is more difficult than working with non-Believer. Elder teams, ministry team leaders, student ministries, pastoral staff, congregants; small group studies. ​Handheld mic, projector, computer, speakers; open space with configured chairs. Following Christ is about building relationships. It is one thing to place faith in Him. Acting as He did and doing as He said is something else. The "fully human" part of Jesus was tempted to respond with emotions, actions and words as we are today. 1 hour; series of small group or Bible study classes optional. Women have bridal showers. Men need wedding baths. This interactive, humorous confab with Roscoe P. Love, Marriage Esq., enables husbands-to-be, husbands-who-be, husbands-who-oughta-be, and young men-who wannabe to be more aware of how they interact with their wives-to-be...and women in general. Adapted version for emerging teens provides guidance on how their attitude and behaviors, as well as words, improve the quality of relationships whether dating, within the family, or at school.